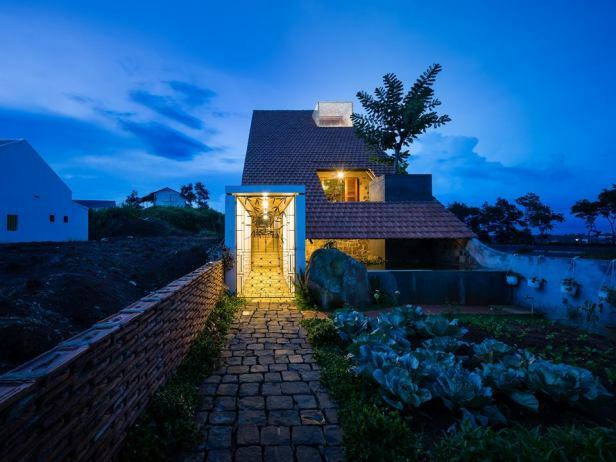 Not different from the shape of the Di Linh plateau, the beautiful house called Uncle’s House by 3 Atelier designed to make people across the area not chiseled. In the Di Linh highlands of Lam Dong province, it is so close to nature that when building houses, people always want to build their houses with the breath of the mountains beside the forest. Performance requirements. House beautiful house belongs to the ownership of the couple and two small children – one boy, one girl. 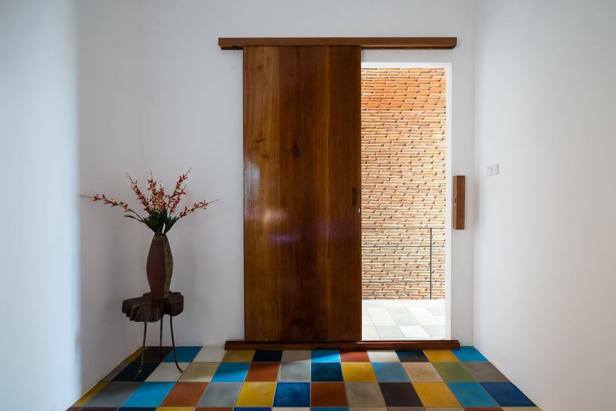 The owner is someone who has helped the Atelier 3 team a lot during their construction of another project in the search for materials. 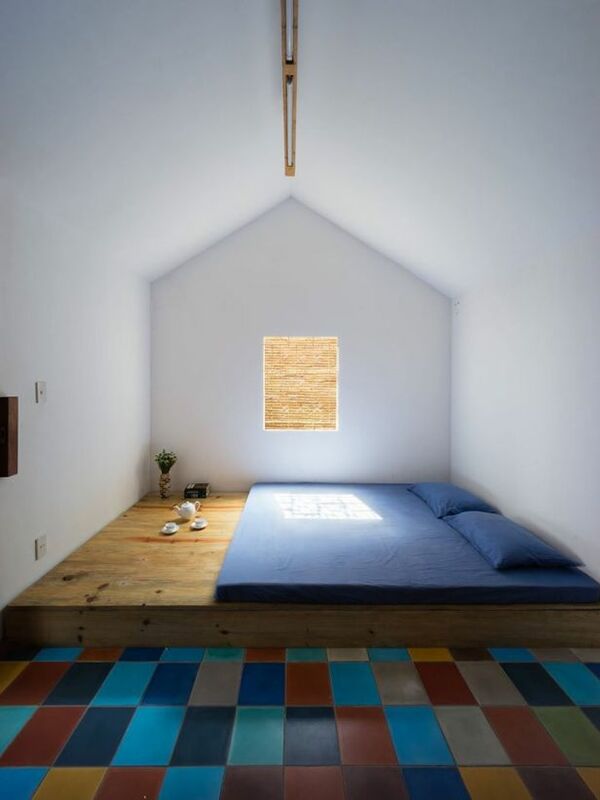 Therefore, when listening to the proposal to design living space for Uncle, the architects of 3 Atelier are willing. This beautiful house called Uncle’s House is also for that reason. 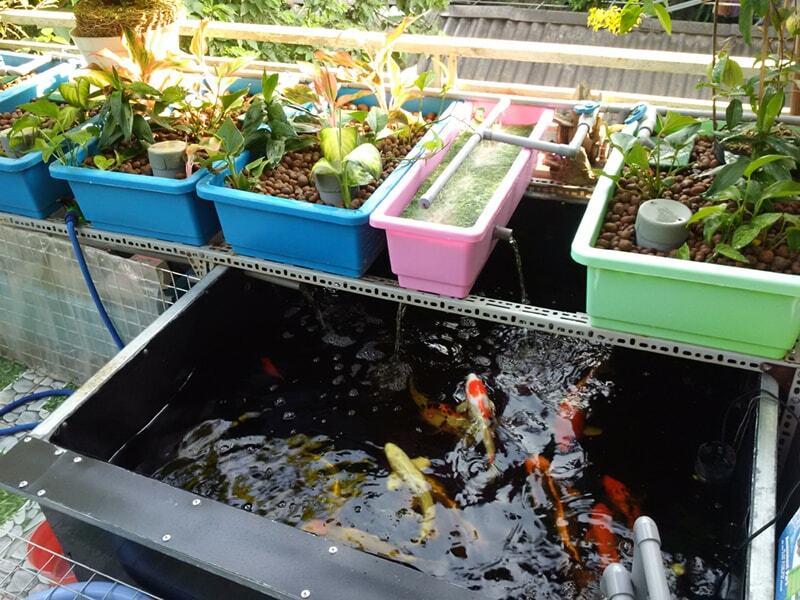 Previously, he has a house near the main market so that his two children are too familiar with urban life. Moving far away from this center, he relied on 3 Atelier’s architects to create a living space with high elevation and natural breath so that his two children could have a chance to wade. I am in the endless nature. 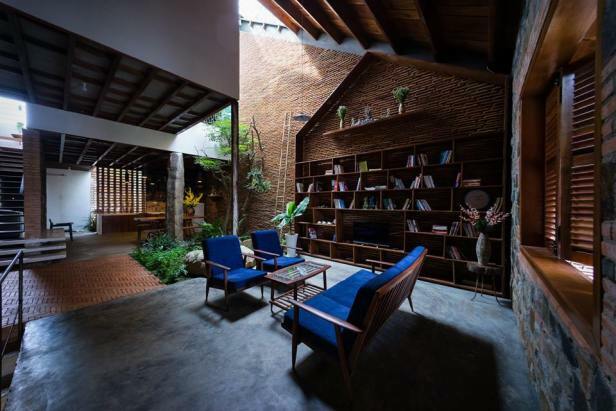 The design of this beautiful house is quite close to the highway but still keep the spirit of rustic, liberal spirit of the Di Linh Plateau as expected. In the front of the house is a vegetable garden. Carefully hand over the rice to have more vegetables to use. 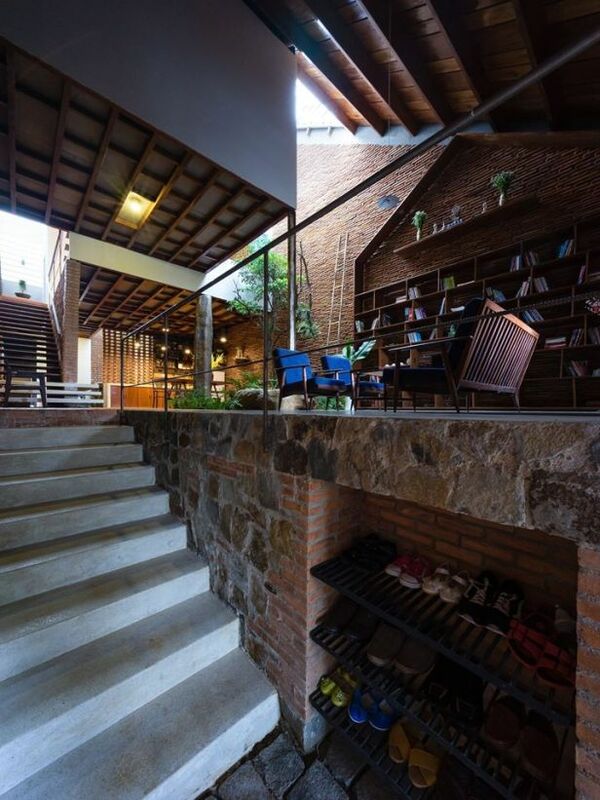 In order to reach the main functional spaces in the beautiful house forced to go up a concrete staircase, rough brick walls are designed as utility shoe racks of the whole house by leaving space and spanning the frames. iron made into a support. 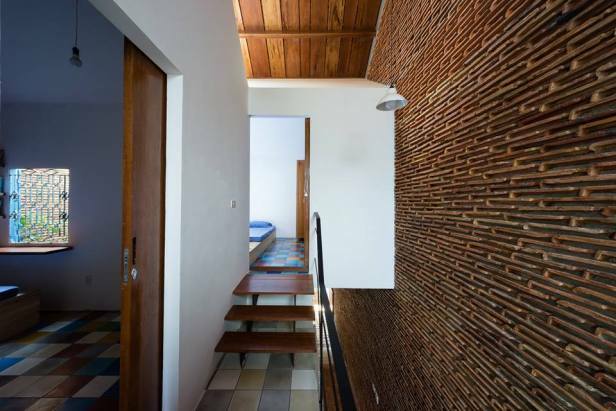 This beautiful house in Di Linh is particularly impressive not only by the appearance of the plateau but even in building materials, the structure inside the house also exudes the liberal nature of this area. 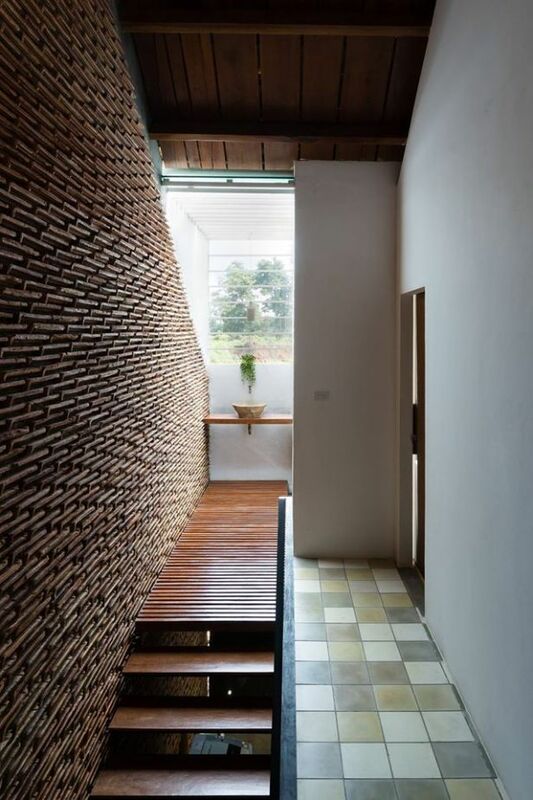 Raw materials such as wood, brick and tile, together make the house more cozy. 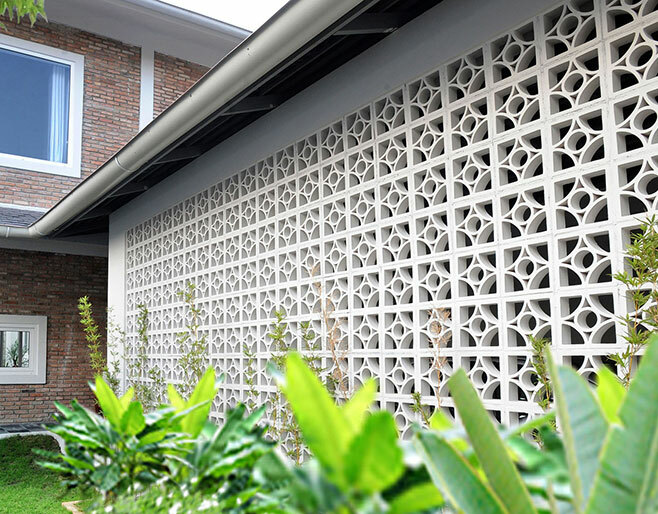 The structure of the building is sunny, natural wind filled the beautiful space. 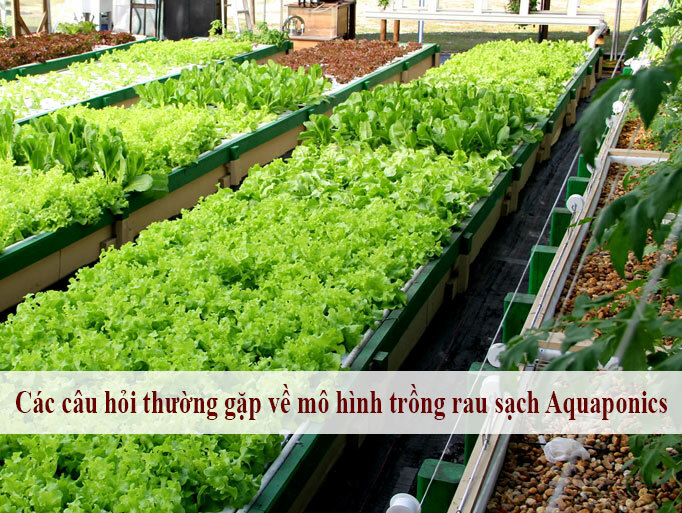 Phòng khách đơn sơ mà ấm áp với sự hiện diện của đồ nội thất gỗ từ bàn ghế đến kệ sách lớn. How a pretty small space with lush trees sprouting eye is space kitchen-dining Spacious family. 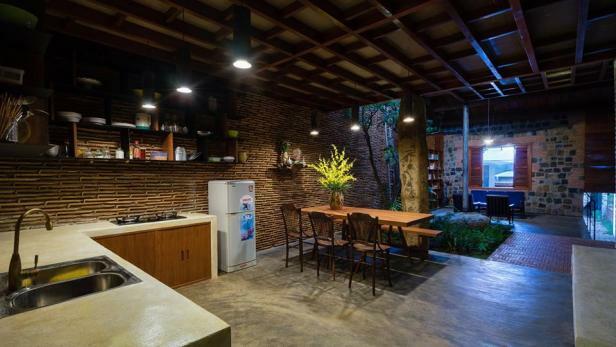 Modern facilities, but due to being located in the space only the presence of raw materials rustic so the kitchen looks extremely cozy, in harmony with the overall style of this beautiful house. Dining room furniture made from wood material brings a sense of closeness. 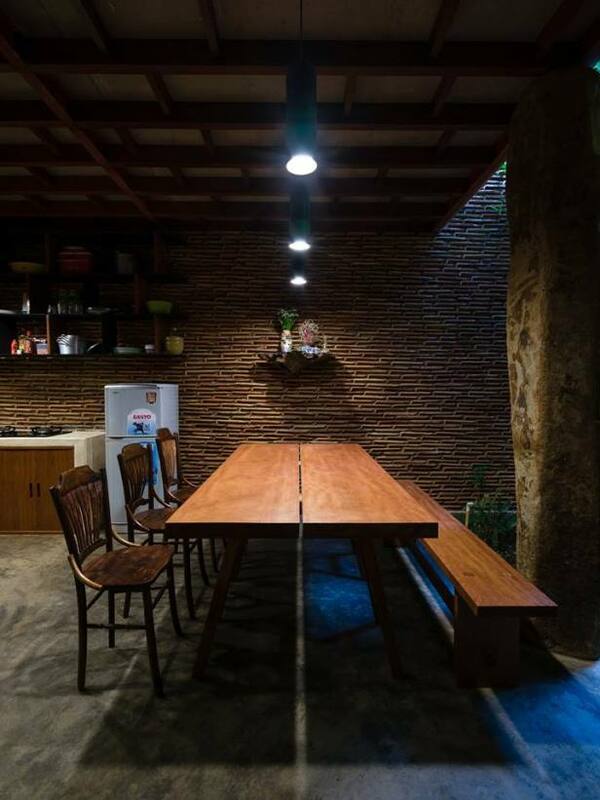 The family’s meals are filled with intimacy thanks to the way the lighting system is installed above. The liberal style is dense in this bedroom design . 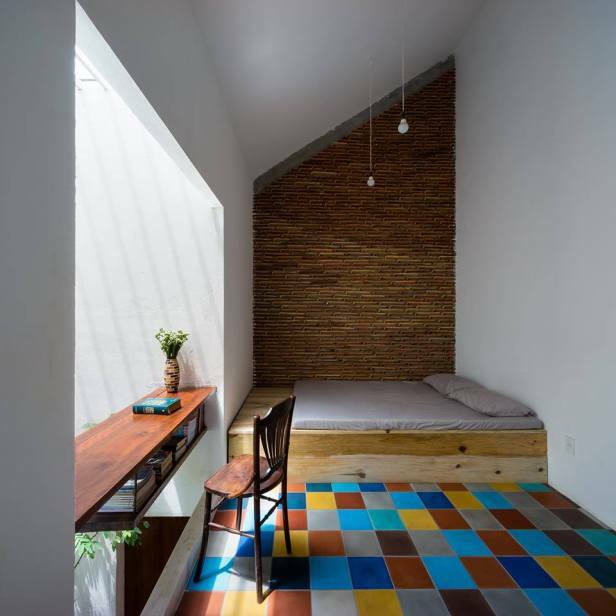 Colorful floor tiles that impressively add to the suspended desk design make the bedroom more special. 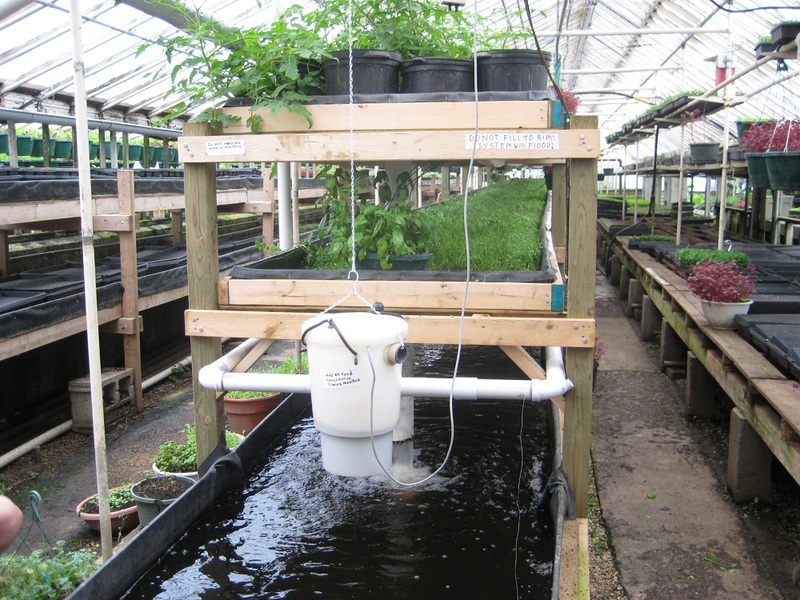 Reflex is used instead of bed. The extra space becomes the corner of the tea. 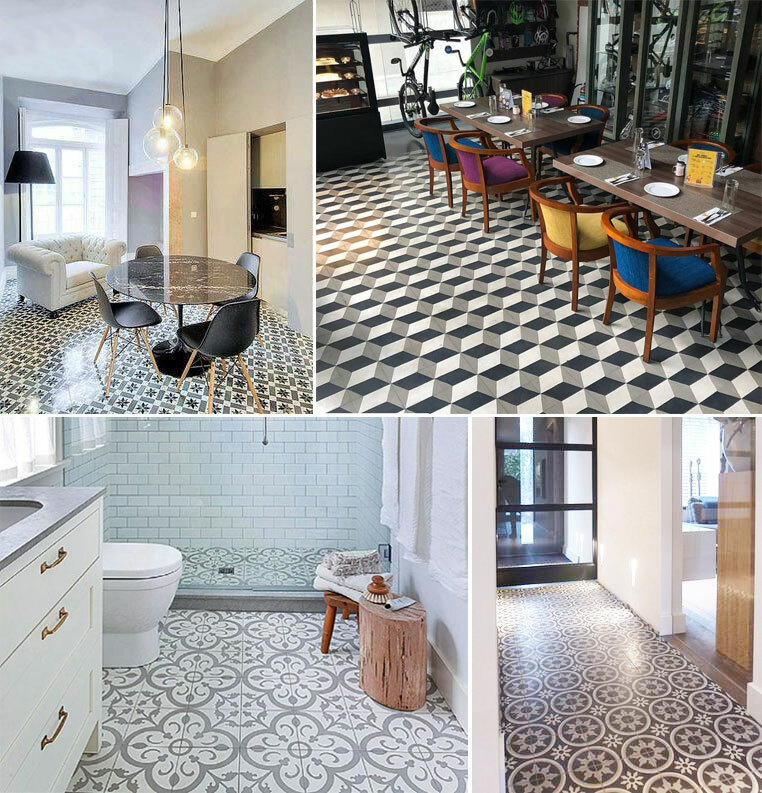 Every corner of the house is carefully taken care of from the decorative flowers to the floor tiles create interesting points for the house.